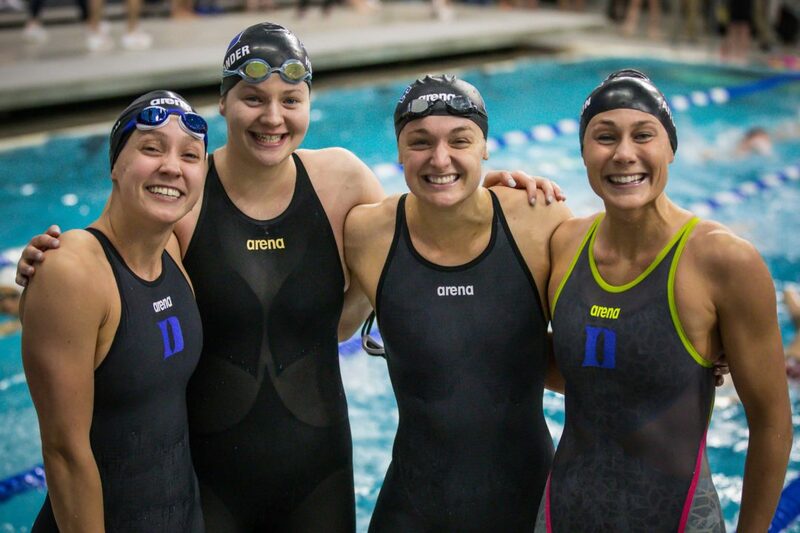 Duke University’s women qualified their first relay for finals at an NCAA Championship in program history by going 1:28.54 in prelims of the 200 free relay Thursday morning. The team of Madeline Hess (22.26), Alyssa Marsh (21.41), Shayna Hollander (22.44) and Hunter Aitchison (22.42) combined for the 11th-fastest swim of the morning. The Blue Devils improved on their time from ACCs and changed up the swim order Last month, they were 22.21/21.85/22.49/22.38 with Marsh leading off and Hess going second. Marsh has been firing off fast relay splits all season long, but primarily in fly. In February, she went 22.33 at the 2019 Nike Cup, which would have tied for the fastest split at NCAAs last season. Her best flat-start 50 free heading into the meet was 22.07, swum at ACCs last month. Hess’ best time is 22.22, and Hollander hasn’t been under :23 with a flat start; the same goes for Aitchison. Marsh qualified ninth in prelims of the 50 free Thursday morning, going a new best time of 21.92, and is entered in both the 100 fly and 100 free. Hess finished 22nd in prelims of the 50 (22.25), and is also entered in the 100 and 200 back. Marsh doing a great job taking Duke to the next level. It’s really cool to see Duke slowly but surely grow into a formidable team the last 10 years. Consistent improvement.